Hey guyz, the post today is pretty much basic, but still many people don't know about uploading a video to blogger in any way--Its so easy. You can add a video to blogger in many ways. You can either upload the video to blogger data base or you can embed the video from YouTube or any other video sharing site. So lets get started ! Browse through your hard drive and choose the video that you want to upload. This is how you upload it to the Blogger data base. By this method you wont be uploading the video to the blogger data base, instead you will embed the video from YouTube. Embedding is in fact just copying the code that YouTube provides with every video so that people can share it online. We will copy that code from YouTube and past it in here in the post editor. For now we will embed the YouTube videos to the post editor, where you write your posts. 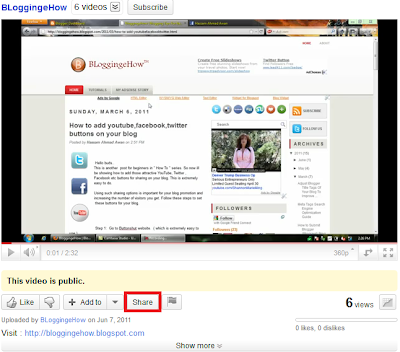 Find the video that you want to embed in Blogger. 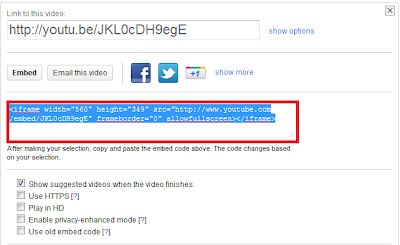 Press the " Share " button, so that you can see the code to embed. Thats all ! Hope that was easy.